DuWop | Launches NEW Blue Venom " Pearly Whites with a Bite "
DuWop introduces Blue Venom, the latest innovation to join the company’s iconic venom collection. Since inventing the lip plumping category over a decade ago with the inception of Lip Venom, DuWop has continued to create revolutionary products including the new Blue Venom (launching March 2011) – a formula designed to make teeth look whiter while imparting volume. Infused with the same plumping ingredients found in the classic Lip Venom, Blue Venom contains cinnamon, wintergreen, ginger, jojoba and avocado, as well as a subtle blue tint to give the teeth a whiter, brighter appearance. Based on the principles of color theory, the slight blue hue found in Blue Venom will enhance teeth’s white tones to give the appearance of a brighter smile. For women who want to create the ultimate plump pout, Garner recommends applying Plumping Paste 3-in-1 treatment masque to the lips prior to Blue Venom as it will exfoliate and condition the mouth first, leaving it primed to shine. DuWop offers beauty with an unexpected twist, featuring multipurpose makeup that’s impossible to live without. 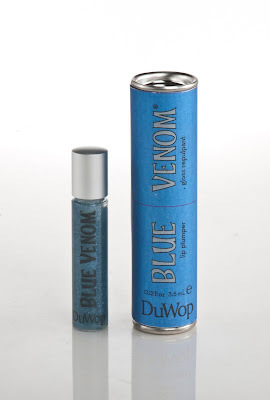 DuWop Blue Venom will be available March 2011at Sephora stores and Sephora.com for $17.00 suggested retail. For more information on DuWop, please visit www.DuWop.com.